In this historic photo from the U.S. space agency, control rods for Plum Brook's Mock-Up Reactor, which entered the core from above, are shown. In the Plum Brook reactor, the control rods entered from below. 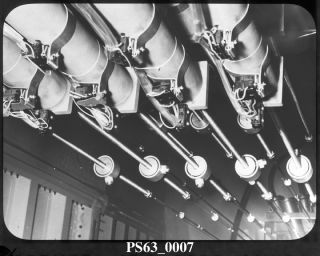 Three types of control rods were used in the Plum Brook reactor: two hydraulically controlled regulating rods to provide precise control of the reactor power level; three mechanically control reflector rods to provide a coarser level of control (the reflector rods had a quick release to allow them to drop and scram the reactor, if necessary); and five fueled shim rods, which performed the same function as the reflector rods.